I have always been a big fan of mince pies and felt I should take it on myself to try all the mince pies within walking distance of the office. Sadly I don't have anything to give a good sense of scale in this photo but this is a very big mince pie. It isn't quite as deep as some of the others on this list but I still think it is the largest overall. The mincemeat is spread as a thin layer across the pie so that it isn't too overwhelming. It is a little too sweet on its own but complements the pastry well. A normal sized mince pie about the same you would expect from any supermarket brand. The amount of filling is equally unremarkable. Where this pie shines is in the filling and even more so the pastry. The filling is nice and moist when there is a tendency for fillings to be too dry. The pastry is easily the nicest of those I sampled. Another normal sized mince pie. A bit more filling than EAT and these definitely look homemade unlike most of the others. The mincemeat has the right amount of sweetness and. The light dusting of icing sugar adds enough sweetness but isn't overpowering (unlike with the Starbucks one). This was also the only mince pie I was able to obtain outside of the national chains. 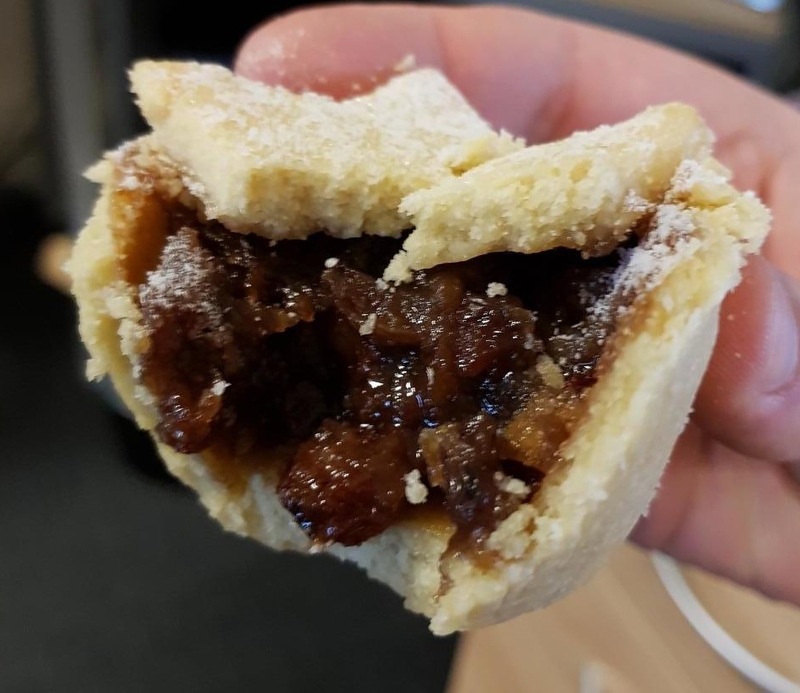 A nice deeply-filled mince pie with lovely flaky pastry. The filling definitely stands out as you can taste the different types of fruit. My only real criticism is that the filling could've been slightly moister. It's the best of the bunch and also the cheapest! Another generously filled mince pie this one is very deep. Sadly the pastry was clearly not designed to contain mincemeat of this magnitude and fell apart way too easily. The mincemeat and pastry were also both far too sweet for my tastes which was only exacerbated by the icing sugar. The only positive was the size but there are better, cheaper options available. So Pret is the winner but I'm glad to see that my local coffee shop is still in the top 3. I'm also not surprised that Starbucks lost out as they seem to think that all baked goods should be overstuffed with sugar in the same way as many of their drinks. All that being said it's sad to see how few independent shops offer a mince pie at all. I tried Coffee Island, Grind and The Espresso Room but none of them offered mince pies. Ty does a vegan mince pie bake but no actual mince pies. Finally Spreads Cafe does offer mince pies but they are shop bought ones. I hope there will be more choice from the smaller coffee shops next year.